Traveling to the motorsports capital of the world, Indianapolis, Indiana, ten-year-old Carson Morgan scored his second consecutive IAME Mini Swift Superkarts! USA (SKUSA) National Championship. On the strength of multiple victories and consistent runs, the young Californian is quickly on the path to success in the world of motorsports. Piloting a Woltjer Racing Engines powered Kart Republic, Morgan was a threat for the championship right out of the gate. Claiming the prefinal win during the first day of competition in New Orleans, Morgan went on to secure third in the main event before returning to the track Sunday to take the top step of the podium. Fast forward a few months to the Phoenix, Arizona rounds of the Pro Tour, Morgan added his second win of the SKUSA championship Saturday but was forced to miss Sunday’s racing action after a flip and a trip to the hospital during Sunday’s prefinal. Knowing that a strong weekend was needed in Indiana during rounds five and six, Morgan delivered with a fifth place result Saturday and stamped in his championship with authority taking the main event victory on Sunday. A huge thanks to long-time karting mechanic and driver coach Garrison Masters who left full-time karting to work on a Lamborghini Super Trofeo team, but still plays a big role in Carson’s results and is part of the Morgan family. Flanking Masters is legendary karting tuner Martin Stone. With a ton of experience around the world, Stone played a major role in assisting Morgan to his second consecutive title. It takes a team around a driver to have the results that Carson has had and Chris Wehrheim was the third and final piece to the puzzle. Working on data and driver coaching, Morgan went on to secure four podiums results including three wins in the six race national championship. Continued thanks to Woltjer Racing Engines for supplying outstanding power and helping Morgan prove that 2017 results were no fluke as 2018 finishes were even better. The trackside support program that Daniel Woltjer and his team offer are second to none and the Morgan family goal is to help him top the blocks this year at the Superkarts! USA SuperNationals. Ryan Perry Motorsports was the home of Carson Morgan in 2018 as the California based team provided a comfortable working environment and provided the tools for success. Last but not least, Morgan would like to send an extra special thank you to Piston Bones Team Graphics and Minus 273 for keeping him looking the best both on and off the track with kart graphics, race gear and apparel. 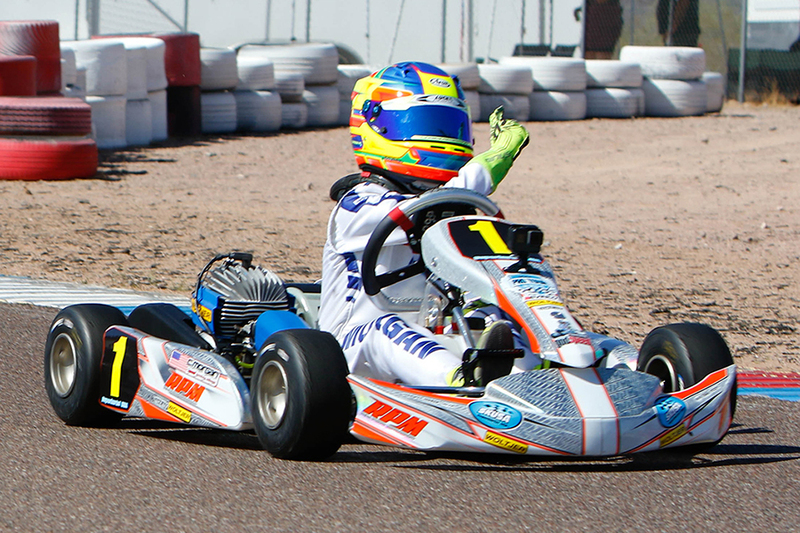 Taking a break from North American karting, Morgan will travel to Europe and compete in three events before returning stateside to Las Vegas for a run at SuperNationals glory. For more information on Carson Morgan, please contact Joe Morgan via email to joe@outsourceucc.com or call 714.928.4373.